Updated website for MP Hire. Makes use of jQuery to manuipulate content appearence. Adobe Contribute used to update page content. 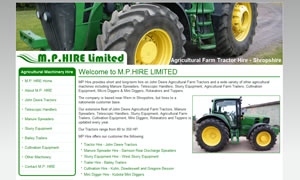 MP Hire needed a fresher looking site so came back to us 5 years after there first site with us was published. Their Google results were so good we kept the content basically the same but updated the look of the website. The wanted to continue using Contribute to update the content so we made use of jQuery to manipulate the content appearence without making the use of Contibute any more complex. MP hire uses Google Adwords for their marketing needs and the Google Urchin tracker for detailed site statistics.